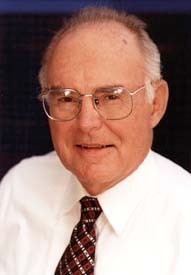 Engineer and entrepreneur Gordon Moore earned degrees in chemistry and physics from CalTech, was hired by William Shockley's Shockley Semiconductor in 1956, and was one of the "traitorous eight" engineers who left Shockley in 1957 to form the pioneering electronics firm, Fairchild Semiconductor. At Fairchild he became one of the world's foremost experts on semiconductive materials, which have much lower resistance to the flow of electrical current in one direction than in the opposite direction, and are used to manufacture diodes, photovoltaic cells, and transistors. In 1968, with Robert Noyce, he co-founded Intel, which has since become the world's largest maker of semiconductor chips. In a 1965 article in the trade journal Electronics, Moore noted that the number of transistors that manufacturers could arrange on a single silicon chip had been doubling roughly every year, and said that he expected this trend to continue. Ten years later he updated his prediction, to say that the doubling would occur only every second year. This prediction has since became known as Moore's Law, and decades later it continues to be applicable in the semiconductor industry. In its common, simplified application it now generally refers to the doubling of semiconductor performance every 18 to 24 months. Moore, retired since 1997, has said that he would like his legacy to be "anything but Moore's Law." He has given $600M to CalTech, and $250M to the environmental group Conservation International.